A Interim Group Management Report 5 Executive Summary 12 Property-Casualty Insurance Operations 22 Life/Health Insurance Operations 28 Asset Management 32 Corporate and Other 35 Outlook 37 Balance Sheet Review 44 Reconciliations Interim Report Third Quarter and First Nine Months of 2014 Allianz Group 7 2014 to 2013 first nine months comparison We generated total revenues of € 92.2 bn, an increase of 9.8 % com- pared to the first nine months of 2013. On an internal basis, revenues grew by 10.8 %. We recorded remarkable growth in savings products premiums in our Life/Health business and higher volume-driven gross premiums written in our Property-Casualty business segment. Lower operating revenues mainly due to decreased performance fees and lower average third party-assets under management in the Asset Management business segment slightly offset this growth. 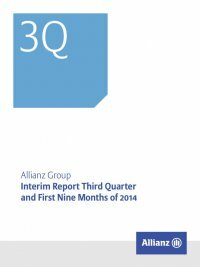 Operating profit 2014 to 2013 third quarter comparison Operating profit – BUSINESS Segments � mn 3Q 20143Q 2013 4,000 3,000 2,000 1,000 0 +5.2% 1,235 769 755 (229) 2,5181 1,422 790 694 (248) 2,6501 Property-Casualty Life/Health Asset Management Corporate and Other 1 Total operating profit includes € (9) mn (3Q 2013: € (11) mn) from consolidation for 3Q 2014. Our Property-Casualty operating profit increased by € 187 mn – or 15.2 %– to € 1,422 mn. This was mainly driven by the absence of natural catastrophe impacts in the third quarter of 2014. Operating invest- ment income (net) also contributed positively. Life/Health operating profit increased slightly by € 22 mn or 2.8 % to € 790 mn. The allocation of certain entities previously reflected in the business segment Asset Management to the business segment Life/Health drove this improvement. Our Asset Management operating profit decreased 8.1 % to € 694 mn, a decrease of 5.0 % on an internal basis. This was mainly becauseofthelowermanagementandloadingfees.Ourcost-income ratio increased by 1.4 percentage points. In Corporate and Other the operating loss increased by € 19 mn to € 248 mn, driven by our reportable segment Holding & Treasury. 2014 to 2013 first Nine Months comparison Operating profit increased by € 461 mn to € 8,144 mn. This was attrib- utable to our Property-Casualty business segment, which benefited from a strong underwriting result driven by the benign natural catas- trophe environment and our Life/Health business segment due to an improved operating investment result. This was partly offset by the operating profit decline in our Asset Management business segment mainly as a result of decreased performance fees and lower average assets under management. Non-operating result 2014 to 2013 third quarter comparison Our non-operating result decreased by € 89 mn to a loss of € 331 mn, mainly driven by a reclassification of tax benefits to operating profit. This was partly offset by an improved non-operating investment result. Non-operating income from financial assets and liabilities carried at fair value through income (net) decreased by € 54 mn to a loss of € 54 mn. This was mainly due to unfavorable impacts of hedging- related activities. Non-operating realized gains and losses (net) increased from € 133 mn to € 184 mn due to higher realizations on debt securities. Non-operating impairments of investments (net) decreased from € 135 mn to € 50 mn, mainly as a result of higher equity impairments in the third quarter of 2013. Non-operating interest expenses from external debt increased slightly from € 207 mn to € 212 mn as the third quarter of 2013 was exceptionally low because one bond was redeemed in the second quarter of 2013 and a new bond was issued in the fourth quarter of 2013. Reclassification of tax benefits had a negative impact on our non- operatingresultof€ 158 mninfavoroftheoperatingresult.Taxbenefits that are attributable to policyholders reduce tax expenses. In the seg- mentreporting,thetaxbenefitsarereclassifiedandshownwithinoper- ating profit in order to adequately reflect policyholder participation.1 2014 to 2013 first Nine Months comparison Our non-operating result declined by € 256 mn to a loss of € 485 mn. This was largely driven by a lower non-operating investment result due to lower non-operating realized gains and higher unfavorable hedging-related impacts in the first nine months of 2014, the reclas- sification of tax benefits in the third quarter of 2014 and the partly offsetting impact of the one-off effect from pension revaluation2 in the first quarter of 2014. 1 For further information, please refer to the paragraph on ‘Reportable segments measure of profit and loss’ within note 4 to the condensed consolidated interim financial statements. 2 For further information on the one-off effect from pension revaluation, please refer to note 4 to the condensed consolidated interim financial statements.